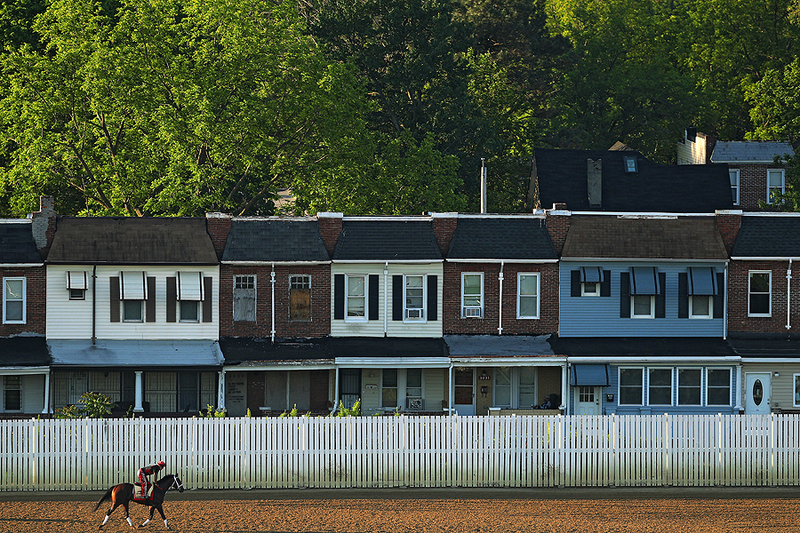 "Classic Empire walks on the track past row homes located on West Belvedere Ave., during a training session for the upcoming Preakness Stakes at Pimlico Race Course on May 17, 2017 in Baltimore, Maryland." I love sports action images, but if I can communicate something more in my photographs, I lean toward features. Each year, the Preakness Stakes at Pimlico Race Course is an important race, and often called the middle jewel, of the Triple Crown. So every morning we photographers find ourselves looking to tell the story of the year - which is typically the Kentucky Derby winning horse training. But this year there was a lot of talk if Pimlico Race Course was in its final year, or years, of hosting the Preakness. According to Baltimore Police, a fatal shooting occurred just a block away from the track, days before the race, so I wanted to help anyone writing that story, a visual.